I’d apologize for the radio silence, but honestly, I’ve been so slammed by life the past couple of weeks that I’ve not really even had time to think about sleeping or eating, let alone writing. One of the reasons I’ve been going insane is because I moved — YAY! Far away from the Amityville Horror house (okay, there were no hauntings or dreams of death, but lots of spiders and ants) to a quaint little two-bedroom apartment. And, in making a move from an 1800 square foot townhome to a closet, I found myself in desperate need of purging many of my belongings. Though when I say my belongings, I actually mean my family’s belongings, because — good Lord — I have inherited some super crazy things that I had to make space for, which is why my spare bedroom is neatly stacked to the ceiling with countless boxes of model trains. Sigh. However, many of my own belongings included a hideous amount of clothing I had collected during my rookie season with the Springfield Rollergirls. I quickly realized there are some things I just had to part with. Coincidentally, I stumbled upon this little gem this week and had to laugh since I had just stuck a pile of cute socks and frilly shorts and skirts in my donation pile, as well as tossed out a helmet I originally picked up at Target and a set of pads that were being held together by silver duct tape. Newbies, don’t worry — we all started out just like you. 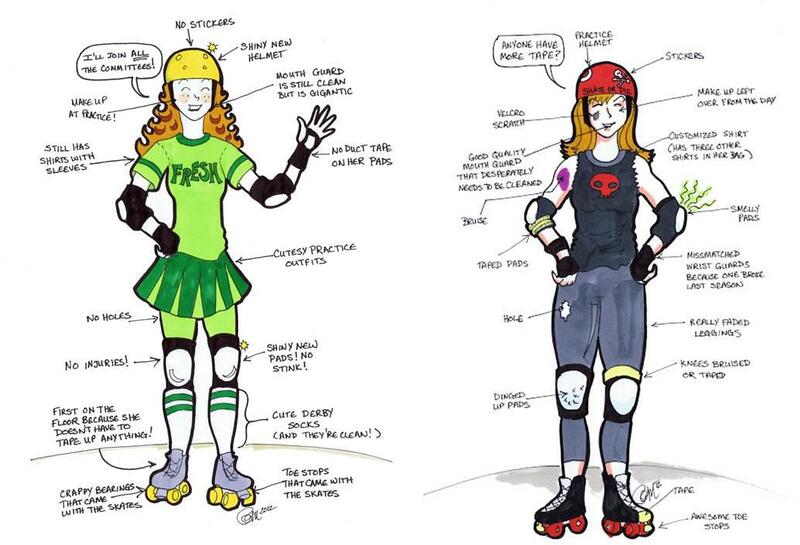 We’ve all been guilty of playing dress up according to what we think derby girls look like. I still have the striped socks, my huge mouth guard, and some of the skirts I used to wear when I played. However, one day I woke up and realized that spending $15 on a pair of blister socks was smarter than wearing thigh high socks. I come to discover that in a bout, my Gumball toe stops make a huge difference when I get hit to the line. I found I was okay with using duct tape to fix the damage I did to my wrist guard while doing layouts at the end of practice versus buying my second set of wrist guards within 5 months. I figured out that vinegar is the only thing that will actually get rid of pad stench. And I wisely invested in a Protech mouth guard that I don’t have to take out in order to talk or drink water. For nostalgia’s sake, I kept much of what I had. It’s a lovely little reminder of just how far I’ve come. I realized this is also kinda how it goes with guitar players. When you’re a beginner, you don’t know any better and believe the hype that the guitar store sales brochures—I mean, guitar magazines—tell you. So you go in, drop several hundred buck on a shiny new guitar that plays like a brick with strings on it, and an amp that will never, ever sound better than your deluded newbie imagination believes it sounds. My guitar case smells like a sweaty bar, the hardware on my Strat is starting to rust, the straps are held on with duct tape, and there’s a healthy chunk of wood missing from the headstock.